Real Madrid avoided the upset this time, beating Leganes 3-0 on Wednesday to move closer to the last eight of the Copa del Rey. After being eliminated by Leganes in the competition's quarterfinals last season, Real Madrid cruised to a first-leg victory at Santiago Bernabeu Stadium. Sergio Ramos netted his 100th career goal to put Madrid ahead, and Lucas Vazquez and Vinicius Junior added to the lead. "It's a great result, having scored the three goals and not conceding any," Real Madrid defender Nacho Fernandez said. "But we know anything can happen, we saw what they did to us last year." Leganes had stunned its Madrid neighbor with a win at the Bernabeu nearly a year ago, but now it will need an even greater feat next week at home to pull off another shocker. "We have to be realistic, it's going to be very difficult now," Leganes midfielder Ruben Perez said. "But we will fight until the end." The victory eased some of the pressure on Santiago Solari's team, which had not won a game in 2019. Madrid was coming off a 2-2 draw at Villarreal and a 2-0 home loss to Real Sociedad in the Spanish league, where it trails leader Barcelona by 10 points. In front of a small crowd at the Bernabeu, Leganes had the better chances to open the scoring before Ramos broke the deadlock by converting a 44th-minute penalty, that was awarded after right back Alvaro Odriozola was brought down inside the area. 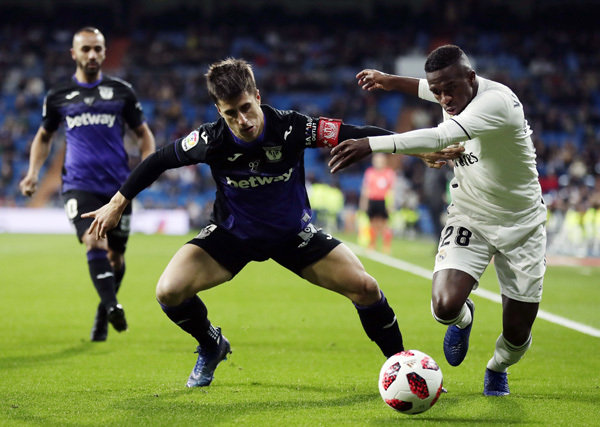 Vazquez scored the second in the 68th after a pass by Vinicius Junior, who 11 minutes later sealed the victory with a neat volley after a cross by Odriozola. Leganes' main threat came from former Middlesbrough striker Martin Braithwaite, who was making his debut with the Spanish club. Ramos, Casemiro and Karim Benzema were the only regular starters in Madrid's starting lineup. Young winger Brahim Diaz entered the match in the second half after being signed from Manchester City on Sunday. Goalkeeper Thibaut Courtois wasn't in the squad after being diagnosed with a muscle injury that is expected to keep him sidelined for about 10 days. Leganes couldn't use goalkeeper Andriy Lunin and young midfielder Oscar Rodriguez because they are with the club on a loan from Madrid. Despite playing with Antoine Griezmann for nearly an hour, Atletico Madrid couldn't manage more than a 1-1 draw at Girona. Griezmann opened the scoring less than 10 minutes into the match but Anthony Lozano equalized for the hosts in the 34th. "Both teams had chances of winning this match," Atletico coach Diego Simeone said.